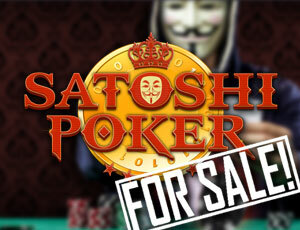 Bitcoin poker site, Satoshi Poker, was put up for sale on April 14 in a 48-hour auction only one year after its initial operation and debut in the Bitcoin gambling industry. Satoshi Poker founder Bart van Oort announced in his post on bitcointalk.org about his decision to put up the Bitcoin-only poker domain up for sale in a public auction, citing his inability to push the site to reach greater heights as the main reason. “After working on the project for the past year, sacrificing my other businesses, investing a lot of time and money and running into personal debts to get it to where it is today, I don’t have the time or personal stability to move the business forward to its full potential,” said the Dutch entrepreneur in his post on the Bitcoin forum. However, no formal announcements of the winning bid or the new owner of Satoshi Poker have been made, considering that van Oort posted in the same thread two days after the auction began that no official bids had been placed yet. van Oort offered the domain, software, and all accounts for a starting bid of 30 BTC. Included in the sale are the fully paid license, $40,000 Enterra Poker desktop client package, and two custom-built backend for processing bitcoin deposits and withdrawals as well as dealing with referral and affiliate income. According to the statistics he posted, Satoshi Poker has 4,648 registered players and generated a total rake of 98.4 BTC in 2013 and 7.6 BTC during the first few months of this year. Moreover, it has a net operation cost amounting to $118.50 per month to cover the rent of a dedicated server and VPS webhosting package. Satoshi Poker is a Bitcoin poker site that offers Hold’em, Omaha, Omaha Hi/Lo, and Stud poker games and supports various limit types. It also offers cash games, tournaments, sit and go’s, and Fifty50 sit and go’s.